After hiking more miles and vertical feet than ever, the season ended too soon for us. January in this part of Idaho brought us less than ideal hunting conditions. We didn’t get out as much as we wanted to. We suffered through seemingly incessant weeks of thick fog, freezing temps, and post-holing crusty snow. It would warm up and thaw out for a day or so only to bring mud so deep that driving through it would only result in making the local paper about the lost hunters who never came back home again. The cold and flu season also ended up taking its toll. About the only productive thing besides a cough was more time to get our new home brewing system set-up. Looking back, we had four months of great hunting. Angus hunted superbly, verifying repeatedly that he’s in his prime. We saw many miles of new terrain, and spent good times with friends and family. 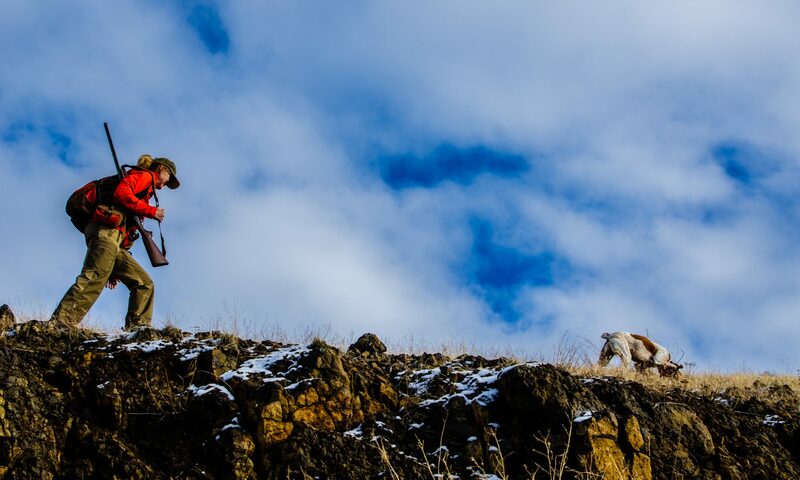 Here are some of our favorite hunting and some non-hunting memories of the 2014-2015 season. Enjoy. We did some early season grouse hunting in terrain much different than chukar hunting. We camped in the boat for opening day. Despite taking tons of crap we still managed to forget part of the backpack stove, resulting in chilling, extra-gritty cowboy coffee. Angus held his tongue on our coffee debacle. We thought it was a peaceful spot to camp until we awoke at 1 a.m. at a 45-degree angle. We learned that the reservoir water level drops during the night. We ran into a lot of nasty goat heads/puncture vines. We had a couple of cast and blast days early in the season. Angus managed to find the only mud bog for miles. On one of the few hunts with The Kid this year, we crawled on hands and knees under thicket. We did GPS waymarking on every hunt. We soaked our hot and tired feet. We had fun skipping stones. We climbed many steep hills. We drank a lot of water. We constantly checked for cheatgrass. We removed plenty of cockleburs. We sometimes had time to stop and pose for a photo. We spoiled our bird dog. We hunted with brother-in-law, Dave. We tried to teach Angus’s nephew how to drink water. We saw lots of amazing points. We had a great time camping but Angus hated the leash. We did a lot of side hill hiking. We gave a bird away for fly-tying feathers. We hunted with an old Brittany named Donner. We followed lots of tracks in the snow. We had some good post-hunt snacks. We laughed watching Angus’s nephew try to steal our chukar. On Christmas Day, we got a glimpse of two of the last three remaining Brownlee bighorn sheep. We even had Angus stick his tongue out at us (he’s not a huge fan of the boat). Parting shot. Looking forward to next season. Great stuff. You described the month of January perfectly. I’ve never had a month quite so inhospitable. Your pictures show a lot of great times in those short four months. Congratulations.I wish we could have got together. Especially since the one picture of your camper is right across the road from where I camped when I was over there.Your brother in laws gun sock is truly a gun sock. I’d love to see what he could come up for a gun boot. Thank you guys for the great season through your blog. You guys enjoy life and Angus the way we all should our lives with our dogs. Thanks for the nice comments. The last part you said about Angus makes me think you probably treat your own dog like we treat Angus. They are special creatures. Next season, we’ll have to make sure our paths cross. Thanks for sharing, I enjoyed the photos. John, Thanks for reading the blog! I’m glad you enjoyed the photos. I’m always trying to find some other interesting bird hunting pics besides just the ones following Bob in the field. Very enjoyable. Your great photos make me regret not taking more photos. This time of the year is saddest. Not sure what worries me more; the fact that are dogs are one year older or that we are. Yes, it’s the saddest part of the year in lots of ways. Crap weather, 7-months before the season opens, how to stay in shape (fishing isn’t exactly aerobic exercise! )… Time to read, write, eat, work, catch up on all the other stuff put off from the devobligation (devoted obligation). Good stuff. Sad time of the year, for sure. Next Sept, our dog will be eight or one year older in human or seven years in doggy years or whatever…he’s still a puppy as far as we are concerned. Great post as always, love your blog. Still liking the Benelli UL? Thanks for reading. Yes, the Benelli UL is the bomb. I added a sling to it this year, which has been great. Sure enjoyed your videos. It inspired me to purchase a head cam for the wife to wear. Looking forward to getting some film of fly-in trips for ptarmigan. I haven’t got her to carry a gun, just the cam. The trips are much more enjoyable with her along.. You are good role models. Keep up the good work. Thanks, Alan. I look forward to seeing your videos with the new wife-cam. Yes, it is more fun as a family activity! Cheers!